State parks could remain open, but historic sites definitely would not. And substance abuse treatment services would receive the $55 million they need to remain active and to secure federal matching funds. But the state attorney general, other constitutional officers and legislative commissions weren’t so lucky. In short, the battle ain’t over, even though the legislature’s annual fall veto session is. Gov. Rod Blagojevich signed legislation Thursday restoring, according to his office, about $180 million that had been vetoed as part of his $1.4 billion budget cuts earlier this year. That leaves about $55 million unfunded from what the legislature wanted to restore this fall. The General Assembly approved a plan to transfer money from special dedicated funds to save state parks and historic sites, programs that deal with substance abuse and developmental disabilities, and funding for constitutional officers. Blagojevich approved half of the plan in September, leaving the restorations up in the air. And some of the budget restorations for state parks could remain up there, as the governor left himself some space to maneuver. Blagojevich announced the $180 million in restorations minutes after the House and Senate adjourned their annual fall session Thursday evening. Through a news release, Blagojevich said certain special funds are restricted by the federal government and could jeopardize future federal funding if swept. “If you discount those federal funds that are restricted, then that only leaves a certain amount available,” said Katie Ridgeway, a spokeswoman for Blagojevich’s budget office. The legislature is not supposed to return until January 12, meaning the governor’s economic plan won’t advance unless Blagojevich calls lawmakers back into special session before then. The governor’s release says he restored $175.9 million, much of it for substance abuse treatment centers, front-line staff for the Department of Children and Family Services and a reduced fare subsidy for the Chicago-area Regional Transportation Authority. Other beneficiaries include state parks front-line staff, water and soil conservation, higher education, mental health and developmental disabilities. The governor did not spare the $2.4 million for the Historic Preservation Agency’s front-line staff, which means the 32 employees already laid off won’t get their jobs back. And without the staff, about a dozen historic sites scheduled to close Nov. 30 will close for the remainder of the fiscal year, says Dave Blanchette, agency spokesman. Another significant portion of the $55 million vetoed by the governor is from Attorney General Lisa Madigan’s office. Functions affected range from personnel to state law enforcement and contributions to the state employees’ retirement system. Ridgeway would only say that the governor made difficult decisions and set a priority of protecting core services. The secretary of state, also, maintained significant losses. Others include the lieutenant governor, the treasurer and the auditor general. The legislative branch wasn’t immune, either. Cut were budget items for legislative research, printing and audits, as well as funding for two commissions that project economic activity and review the governor’s administrative rules. Thursday was a historic day in the Senate. Wednesday night’s rare, simultaneous internal elections of new leaders for the Democrats and Republicans undoubtedly will change the dynamic of leadership in the Capitol. Sen. John Cullerton of Chicago is slated to become the next Senate president and leader of the extraordinarily large Democratic Caucus. Across the aisle, Sen. Christine Radogno of Lemont will replace Senate Minority Leader Frank Watson as the first female caucus leader of either party. They start in January. The mood in the Capitol Thursday felt lighter. People smiled, mingled, debated some serious legislation and congratulated each other. Perhaps the most touching moment came when Watson returned to the chamber floor for the first time since experiencing a stroke last month. Shortly after the stroke, he announced he would not seek re-election as minority leader but would continue to serve as a senator. He spent four days in the hospital, 18 days in recovery and numerous days in therapy, but on Thursday, he Watson was walking, talking, laughing and crying. He broke down as he recalled the way he felt when he realized he had the symptoms of a stroke: slurred speech and difficulty walking. “I thought of [former Sen.] John Maitland and my dad,” he said, unable to finish his sentence through the tears. Both had serious strokes with lasting side effects. We’ll have much more from Radogno in the coming months of Illinois Issues magazine. Watch Illinois Issues for more about Cullerton’s first priority: advancing a long-awaited capital bill. The state’s bipartisan legislative Commission on Government Forecasting and Accountability projected the state’s budget shortfall between $2 billion and $3 billion for the current fiscal year, FY09. And that striking deficit includes a one-time windfall when the state collects on a lease of the 10th casino license. This and previous governors have applied that power to state agencies under the governor’s control in the past, but the new proposal would expand that authority and allow Blagojevich to impound some additional funding for K-12 education, higher education and state pension funds. It also potentially would allow Blagojevich to collect some tax revenues typically shared with city and county governments. The same power to reserve up to 8 percent also would be extended to other statewide officers. The governor already applied a 3 percent reserve on state agencies and cut funding for constitutional officers earlier this year. The potential for further reserves begs the question of how state managers would be able to cut more programs or institute more furlough days than they already have. While the House could move the bill Thursday, Trotter said the Senate could still act on it by week’s end or in the first two days of session in January. Either way, the FY09 budget is in bad shape, and the Commission on Government Forecasting and Accountability projected that FY10 will be worse. The first thing that sticks out, Hannig said, is a massive payment to the state’s five pension systems for public employees. He anticipates an additional $1.2 billion payment, and if revenue projections are accurate, the state might not even garner $1.2 billion in growth for FY10. “If we don’t do something, we may not even be able to make the pension payment next year, let alone anything else,” Hannig said. To avoid ending on a bad note, take the advice of Scott Pattison, executive director of the National Association of State Budget Officers. He spoke to Statehouse reporters during a national conference in North Carolina last week and said: Look forward to FY11, when things actually might start to look better. Hannig agreed with that projection and compared post-FY11 to a spring day after the long, dark days of winter. Democratic Rep. Art Turner of Chicago is one of three finalists to lead the Paul Simon Public Policy Institute at Southern Illinois University Carbondale. The center plans to replace Mike Lawrence, the executive director who retired, in January. The other two finalists include veteran journalists, William Freivogel, director of SIUC’s School of Journalism and a longtime journalist for the St. Louis Post-Dispatch, and David Yepsen, a political columnist with the Des Moines Register. Matt Baughman, who has been with the institute for a decade in various capacities, is serving as interim director. Turner, who is in Springfield this afternoon for an abbreviated fall session of the General Assembly, says if chosen, he would resign his legislative post and move with his family to Carbondale. We'll have more soon. The national economic doom and gloom is starting to cast ominous clouds on existing state budget problems, leading Gov. Rod Blagojevich and other state officials to propose some ways to adjust. So far, it seems as though the state is running in place. There’s no indication that the General Assembly and the governor are going to start getting along any time soon to follow through on some of these proposals. The legislature returns for its annual fall session Wednesday and Thursday. Friday is still up in the air. The governor's proposal foreshadows this month's closure of numerous state parks and historic sites, as well as reduced human services, that resulted from $1.4 billion in budget cuts. While the first two rounds of money already have been transferred from special dedicated funds to help restore some of the funding, the governor hasn’t yet signed legislation authorizing the spending. He has until December 5 before it automatically becomes law. In the meantime, Blagojevich released a four-point plan that includes borrowing money, asking the feds for some bailout money and withholding more state money. Announced through a news release, part of the plan would create a new law for emergency budget management. He seeks authority to hold as much as 8 percent of general revenue funds in reserves for state agencies, education, higher education, state pension funds and local government funding. That would be on top of the 3 percent reserves he already requested. Another portion of his new plan seeks as much as $3 billion in federal aid during the next three years. Part of his proposal also relates to Comptroller Dan Hynes’ idea announced last week. It would allow the state to borrow money, which is nothing new. But instead of having to pay back the loan by the end of the state’s fiscal year (June 30), the state would have 12 calendar months to repay the loan. The premise is that because the comptroller would have more time to repay the loan, his office would have more flexibility in cash flow. The proposal would need legislative approval by a three-fifths majority of each chamber so it could immediately take effect. Right now, cash flow is a huge problem because the state can’t pay about $4 billion of its bills, including Medicaid payments to medical providers. The comptroller wrote in a letter to state officials to announce that the backlog could top $5 billion and inflict 20-week delays for payments by March. “To characterize this as an imminent crisis risks understatement,” he wrote. Senate Republicans describe the governor’s four-point plan as “begging and borrowing.” Sen. Christine Radogno, deputy minority leader from Lemont, says while she could support further belt tightening for state agencies or regular short-term borrowing as legitimate cash-management tools, she wants specifics that aren't available from the governor's press release. And she says she has concerns about short-term borrowing that crosses over into the next fiscal year, as proposed by Hynes. “I’m certainly willing to look at any proposal of the comptroller or the governor, but we just need to be careful not to fool ourselves and the taxpayers,” which, she says, are the same taxpayers who are footing the bill for the federal government’s $700 billion bailout package approved last month. Cindy Davidsmeyer, spokeswoman for Senate President Emil Jones Jr., says he acknowledges that the state is facing a huge crunch, and he looks forward to hearing more details as they come out. House Speaker Michael Madigan’s spokesman, Steve Brown, says only that the plan is under review. Also Tuesday, a new diverse, well-funded education policy group announced efforts to issue comprehensive reforms by this spring, although it’s unlikely that the group’s recommendations would be ready to go by the time the legislature is supposed to enact a state budget for fiscal year 2010. Founders of Advance Illinois, a nonprofit based in Chicago, plan to travel around this state and others to gather evidence during the next six months. The goal is to take a broad and long-term view of ways to reverse some of Illinois’ worst academic trends that hamstring its students and workforce. Ellen Alberding, president of the Joyce Foundation, serves on the board and says the Chicago-based foundation funds educational policy efforts throughout the Midwest. Illinois’ condition sticks out, she said after the news conference, because a large gap exists between educational attainment of low-income minority students and higher-income white students. According to information released by the group Tuesday, Illinois ranks 6th in the nation for having one of the largest achievement gaps between African-American and white students. Alberding also said she was struck by a study of Chicago students that shows only 10 percent of eighth graders who score well on the Illinois Standards Achievement Test later score 20 or above on the ACT, which indicates that most students in the study were ill prepared for higher education. “It’s outrageous that the state has its expectations so low,” she said. The Joyce Foundation supports the new effort along with the Bill & Melinda Gates Foundation, the Chicago Community Trust, the Grand Victoria Foundation, the John D. and Catherine T. MacArthur Foundation, the McCormick Foundation and the New York-based Wallace Foundation. Board members include a vast political mix, starting with co-chair and former Gov. Jim Edgar. The Republican unsuccessfully pitched a plan in the 1990s to reduce local property taxes and increase state income taxes as a way to reform education funding. He said Tuesday that he still believes the state relies too heavily on local property taxes to fund education, but the group would not focus on funding reforms. It only would announce recommendations for funding reforms as part of a more comprehensive plan, he said. Deflecting the focus away from the question of whether taxes would increase, however, will be a challenge. The other co-chair is former U.S. Commerce Secretary Bill Daley, the Democratic brother of Chicago Mayor Richard Daley and a rumored candidate for governor in 2010. Also among the board members is former U.S. House Speaker Dennis Hastert, a Republican who helped lead negotiations between Blagojevich and legislative leaders to draft a capital program for road and school construction projects. That plan stalled. Former state Sen. Miguel del Valle, a Democrat and current city clerk of Chicago, used to chair the Illinois Senate Education Committee. Del Valle said Tuesday that Advance Illinois “is the most promising” of all the efforts he’s seen to reform public education. As we head into the first week of the Illinois General Assembly’s fall session, the biggest questions are who will be selected to lead the Senate Democrats and the Senate Republicans? Leaders of both caucuses are stepping down, opening the door for a rare change in leadership that has potential to drastically change the atmosphere in the Capitol. See this month’s Illinois Issues magazine for information about the Democratic race for Senate president. So far, two Senate GOP members are openly seeking the minority leadership position, while two others are mentioned as potential candidates if the caucus can’t agree. Sen. Christine Radogno of Lemont and Sen. Kirk Dillard of Hinsdale both represent suburban Chicago districts in mostly DuPage and Will counties. Both have described themselves as fiscal conservatives who can work with different factions within the Illinois Republican Party. And both say they have a good understanding of issues throughout the state. Radogno says she’s “definitely” interested in becoming Senate minority leader. Although she says she had absolutely no intentions to become a career politician, she now fills the caucus’ No. 2 position and serves as its budget negotiator. She also ran for statewide office in 2006 but lost to Democrat Alexi Giannoulias, the current state treasurer. Dillard also uses the word “definitely” in describing his interest in the position. “I definitely know that I am the best person to move my caucus and the state’s business forward in Springfield.” He says the principles in which he ran Edgar’s office as his chief of staff and in which he used to run the DuPage Republican Party are the blueprint for the way he would operate as a Senate leader. Dillard sought the leadership position before, but the caucus selected outgoing Senate Minority Leader Frank Watson. Watson announced last week that he would not seek the position after having a minor stroke last month. Some dissention did occur when Dillard, who says he has a personal relationship with President-elect Barack Obama, appeared in a TV ad for the Democrat during the campaign season. But Dillard cites his relationship with Obama as helping to break the logjam of recent ethics legislation, in which Dillard says he was one, with Comptroller Dan Hynes’ leadership, who encouraged Obama to call Senate President Emil Jones Jr. to call the bill for a vote. Dillard also cites his legislative work with Obama to revise the state’s death penalty statute. Two other names mentioned as possible compromise GOP candidates are Sen. Dave Luechtefeld of downstate Okawville and Sen. Dale Risinger of Peoria. We’ll see if commitments to the leadership candidates solidify this week and next. Republicans have an internal caucus meeting scheduled for November 19. The Illinois Senate will return to the Capitol on Wednesday and is scheduled to meet through Friday, although that could change. The House canceled the first week of session and won’t convene until November 19. Action during the so-called veto session could be somewhat light but significant if the General Assembly considers allocating more money to such state agencies as the Illinois Department of Transportation. Veto session serves as a good time to review the state’s fiscal realities, including whether revenues match up to spending. They don't, according to the Illinois Department of Revenue. They're $800 million out of whack. This comes on top of Gov. Rod Blagojevich’s $1.4 billion budget cuts that are causing state parks and historic sites to close this month, although the General Assembly approved ways to restore about $221 million to keep those sites open and to save some social services from closing. Blagojevich still hasn’t signed Senate Bill 1103, which would release the money. He has until December 5 to do so before it automatically becomes law. Watch for Senate action that would take one more step toward the state’s first clean-coal power plant. Senate Bill 1987 would kick off a study to estimate the cost and design of the proposed Taylorville Energy Center, but it also would set the framework for the state’s long-term energy portfolio. Future power plants would have to use Illinois coal and advanced technology to reduce pollution, and the door would open for a system of carbon tax credits as one more way to reduce pollution. Tenaska Inc., a Nebraska-based energy company, announced today that it already purchased half of the land for the energy center. This Thursday, the Illinois Supreme Court will consider the controversial medical malpractice law that limits the amount juries can award for pain and suffering caused by malpractice. See the background here. I’ll be on an airplane headed for North Carolina for the annual CapitolBeat conference for Statehouse reporters Thursday, so, unfortunately, I’ll catch up with these updates next week. What does President-Elect Barack Obama’s win mean for Illinois? Read Illinois Issues’ PRE-election analysis here. Stateline.org reporter Dan Vock reminds readers that while Illinois officials form their wish lists, this state won’t get its fair share of construction dollars or other earmarks unless the state General Assembly and the governor finally approve a capital plan. Also, Obama has "railed against earmarks," Vock writes. In the next year, we'll also watch for Obama’s presidency to affect Illinois tourism and Illinois scrutiny. And he could increase awareness about life in urban areas, as well as the effort to protect the Great Lakes and, maybe, just maybe, the effort to bring FutureGen to Mattoon. Whether that all translates into more money for Illinois, however, will be interesting to watch. If Obama continues to recruit Illinoisans to his cabinet in Washington, D.C., then the vacancies left by those state and Chicago officials will enhance the domino effect already in play. Obama ’08 completely changed the ground game and the technological savvy required of political campaigns. What is the future of the Illinois GOP? Former Illinois Gov. Jim Edgar says his party needs to move toward the center, particularly when recruiting gubernatorial and U.S. Senate candidates. That’s with the understanding that some politicians should continue representing their conservative Illinois districts. Edgar also says the thing that concerns him the most is that to be a viable political party nationally, the GOP has to secure the Hispanic vote. “We’re going to have to show a little more sympathy and understanding and try to bring Hispanics in more party roles and run them for office and show that we appreciate them being part of the Republican Party.” Either way, the state GOP will have to overcome perceptions of the national Republican Party, which Edgar says took most of the blame in the court of public opinion for killing immigration reforms a couple of years ago. He, like Edgar, says the middle is where the GOP needs to aim if it wants to attract and retain new individuals in Cook and Lake counties. He points to the reelection wins of two moderate Republicans in the Chicago suburbs: Rep. Rosemary Mulligan of Des Plaines and Rep. Beth Coulson of Glenview. Both survived targeted races. “And they’ve been able to withstand the Democratic Party because their issues and their positions are much more aligned with the people living out there,” Green says. He adds that his philosophy on what the Republicans should do resembles what he wrote for Illinois Issues in 1978: Downstate holds the key to victory. Right now, he says, downstate is irrelevant. If Democrats carry Chicago, suburban Cook County and a few of Chicago’s surrounding counties, then there aren't enough people downstate to help Republicans win a statewide election. Will Con-Con 2008 turn into Con-Con 2010? Read Wednesday’s post to see what Con-Con supporters say. They are unlikely to pursue legal action to reverse or redo Tuesday’s 68 percent “no” vote. But they likely could pursue legal action to clarify the process of future referenda. The ballots are in, but legal concerns are ongoing. Sixty-eight percent of Illinois voters on Tuesday rejected the call for another constitutional convention. The results don't satisfy a group of supporters who still want clarification about the process of putting that question before voters, as constitutionally mandated every 20 years. At this rate, the 2008 question could drag out until 2010. Lt. Gov. Pat Quinn says he is considering whether to file a new complaint over the handling of the referendum or to continue seeking the Illinois Supreme Court’s clarification on the issue. Quinn says voters in numerous counties did not receive their blue pieces of paper, as mandated by a judge last month. From the beginning, Quinn and others who supported the call for a convention expressed concerns that the language was misleading, which was affirmed by two court decisions. He says if opponents can defeat this referendum, then opponents of future referenda could do the same. The Chicago Bar Association, meanwhile, does not plan to file another lawsuit over the results of the referendum, says Steve Pflaum. He's the association’s general counsel and a partner with McDermott Will & Emery in Chicago. However, the association does plan to ask the Illinois Supreme Court to review a lower court’s opinion to determine whether the ballot was unconstitutional and whether the remedy of a so-called corrective notice was inadequate. Pflaum estimated that the association wouldn’t file the appeal with the Supreme Court for another month. And if the high court ruled that the referendum had to be redone, he says it most likely wouldn’t happen until the 2010 General Election. The association also is asking voters who did not receive their blue notices with their ballots to fill out affidavit forms to help plaintiffs gather evidence. The appointee will serve until 2010, when the seat opens up for another six-year term. The governor could choose anybody, ranging from himself to one of the Democratic members of the U.S. House to outgoing Illinois Senate President Emil Jones Jr. But Blagojevich told reporters in Chicago that he’s not interested in that job. Speculators also have considered that Blagojevich would pick one of his potential gubernatorial opponents, including such state officers as Attorney General Lisa Madigan, Comptroller Dan Hynes or Treasurer Alexi Giannoulias. Tammy Duckworth, Illinois’ director of the Department of Veterans’ Affairs, also has been mentioned. But it’s all speculation about what an unpredictable governor would do. 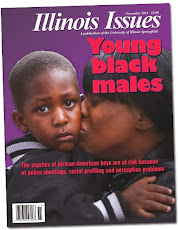 Illinois Issues magazine will have more in the coming months. Update: I was interviewed by WILL-am's Focus 580 this morning. Listen here. There were two questions heading into Election Day in Illinois. The first was how far the Democratic wave would overcome traditionally Republican areas. The small tide in the Chicago suburbs swept away at least one and potentially two suburban Republican incumbents in the House. The Dems gained another open seat in Peoria. But Republicans also held on to a number of open seats and even gained one in southern Illinois. The Democratic majorities in both chambers, on the other hand, remain in tact. The second question was how the GOP would rebuild before 2010. One change is that Senate Minority Leader Frank Watson, who suffered a minor stroke in October, told his members Tuesday that he would not seek the leadership position again. We’ll consider who could take his place in another blog. The Senate’s makeup remains the same, with 37 Democrats and 22 Republicans. The Democratic Caucus, however, hasn’t unified to make use of its so-called supermajority in the past two years. The retirement of Senate President Emil Jones Jr. in January will open the door for change there, too. The House Democratic Caucus increased its majority from 67 to 69 members out of 118. And they could gain one more, pending official results in what turned out to be a barn burner. If the Democrats gain 70 members, they're one member away from the magic number needed to approve major spending, borrowing and other legislation without Republican votes. House 66: GOP Rep. Carolyn Krause is retiring. The race is still too close to call this morning, but Democrat Mark Walker leads Republican Christine Proncho, as of this morning. If Walker is declared the winner, among the dynamics in play was the “Obama factor,” where a record number of Democratic voters cast ballots for President-Elect Barack Obama of Chicago. House 85: Rep. Brent Hassert, a Romeoville Republican in Will County and a member of the House Republican’s leadership team, lost to Democrat Emily Klunk-McAsey. The Democratic campaign machine was in the works, with the help of the Obama factor; Hassert was active in gaming and revenue issues. House 43: Rep. Ruth Munson, an Elgin Republican, initially appears to have lost to Democrat Keith Farnham. A Green Party candidate, Dane William, got 3 percent of the vote. [UPDATE 5 p.m.: Munson's campaign office confirmed that the representative conceeded to Farnham this afternoon. The office cited the vote: Farnham's 12,589 to Munson's 12,911, a 322 difference. The county clerk will have to count provisional ballots and absentee ballots within 14 days of the election.] Munson currently serves on committees related to business, technology, trade and pensions. The district is vulerable to the Democratic wave. A Democrat took the Senate district from Republicans when former Sen. Steve Rauschenberger retired. And the House district adjacent to Munson’s transferred from Republicans to the Democrats when Rep. Fred Crespo defeated veteran GOP Terry Parke in the last election. The Obama factor was at play. House 92: GOP Rep. Aaron Schock ran for Congress and won that seat last night. He will be replaced by Democrat Jehan Gordon, despite some alleged credibility problems released about the candidate during the campaign. Gordon beat out Republican Joan Krupa. Before Schock, the Peoria district historically was Democratic territory. Senate 59: Sen. Gary Forby, a Benton Democrat in the southern tip of Illinois. He barely won against Republican Ken Burzynski, the brother of state Sen. Brad Burzynski of Clare. It was the most expensive race for legislature in the state. The Campaign for Political Reform reported that a total of more than $2 million was spent by both sides. Forby fought hard during the electricity rate debate but was the sacrificial lamb in a political move by Senate President Emil Jones Jr. That opened the door for his Republican opponent to say Forby failed to get lower Ameren rates for his constituents. Senate 42: Sen. Linda Holmes, an Aurora Democrat, kept her seat. It was another expensive race exceeding $1.5 million, according to the Campaign for Political Reform. Holmes edged out Terri Ann Wintermute of Bolingbrook. Holmes took over the suburban seat when Republican former Sen. Ed Petka retired; Holmes got a lot of financial support from Sen. John Cullerton, one of the Democrats in the running to replace retiring Senate President Jones. House 17: Rep. Beth Coulson, a Glenview Republican in northern Cook County, and active voice for human services and environmental issues. She pulled out the win. House 46: Rep. Dennis Reboletti barely won in 2006. He took the seat after former Rep. Lee Daniels retired. House 48: GOP Rep. Jim Meyer is retiring. Republican Michael Connelly won the race against Democrat Joe Heneghan. House 96: GOP Rep. Joe Dunn is retiring from the DuPage and Will County district that includes Naperville. Republican Darlene Senger barely beat out Democrat Diane McGuire in a race where about $1 million was spent. Senate 26: GOP Sen. Bill Peterson is retiring from the seat, which represents the northwest suburbs of Chicago in Lake and McHenry counties. Republican Dan Duffey comfortably won against Democrat Bill Gentes. House 107: Democratic Rep. Kurt Granberg retired. He'll be replaced by Republican John Cavaletto, who challenged Granberg in a tight race in the last election. Cavaletto defeated Democrat Patti Hahn Tuesday. Personal story: I have a distinct memory of U.S. President-Elect Barack Obama. When I worked as a health reporter in Decatur, Obama visited a local community college during his first year as a U.S. senator. He met with military veterans and talked about their health care, among other things. After the event, Obama made himself available to a handful of reporters. He answered our questions, and then most of the reporters except me said thanks and walked away. I asked for one more question. He said I could ask as many as I wanted and suggested we walk into a neighboring room so he we could hear each other better. We walked into the next room, and he pulled two folding chairs over for us to sit. Except he turned his chair around so that he straddled the chair and rested his elbows on its back. He stayed until I asked all of my questions. Unfortunately, I don’t remember his exact answers. But what stuck out were his mannerisms and his willingness to answer as many questions as I had. No staffers tried to cut off the conversation and whisk him away to his next appointment. Some of my fellow reporters haven’t had as good of luck when trying to break through the communications lines of Obama’s presidential campaign. I can only hope that a President Obama would remain as genuine, considerate and open as he was in the that instance.